consumer credits - LET'S EARN MONEY TOGETHER ONLINE !! HOW DO YOU BUY ADDITIONAL CONSUMER CREDITS? Firstly you must appreciate the difference between Bonus Consumer Credits and additional Consumer Credits. These are the Consumer credits that you receive as a bonus when buying an AD PACK. They must be kept for the full 4 months after which time they would have multiplied in quantity by a factor (X8) and can then be sold. These consumer credits also multiply by a factor of X8 over a 4 month period but they can be sold at anytime. WHERE DO YOU VIEW YOUR BONUS CONSUMER CREDITS? The Bonus Consumer Credits are not displayed on the same page as the Additional consumer Credits. --This page will display your Bonus Consumer Credits. WHERE DO YOU VIEW YOUR ADDITIONAL CONSUMER CREDITS? There is something important to know about additional ucash and referral commissions. 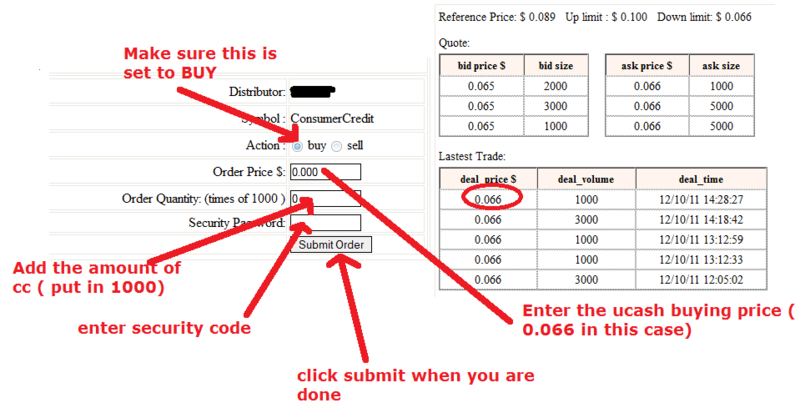 When you receive a referral commission, 20% goes into a special trading account ( see diagram below) and can only be used to purchase additional CC. Seeing that on average each CC at present can be bought for$0.055 ( this will constantly change so make sure to know the current price ) and you can only buy 100 CC at a time, anytime this "trading account" exceeds $5.50 in value, you should purchase 100 additional CC. Also note that additional CC can also be bought FROM YOUR UCASH BALANCE ( 1000 at a time) using the same procedure outline above.